I remember watching the first run of the Teletubbies when it started in 1997 (I was 5 years old) and also when my sister was born in 2002. We both absolutely loved it so I was really excited to hear about its revival and hoped my children would love it just as much. As with any remake, I do worry that it won't be on par with the original but I needn't have worried. It's almost exactly the same with a few little changes. Instantly, my children fell in love. They get so excited when they see the "baby sun" and C kept asking for Teletubbies toys on his birthday list. 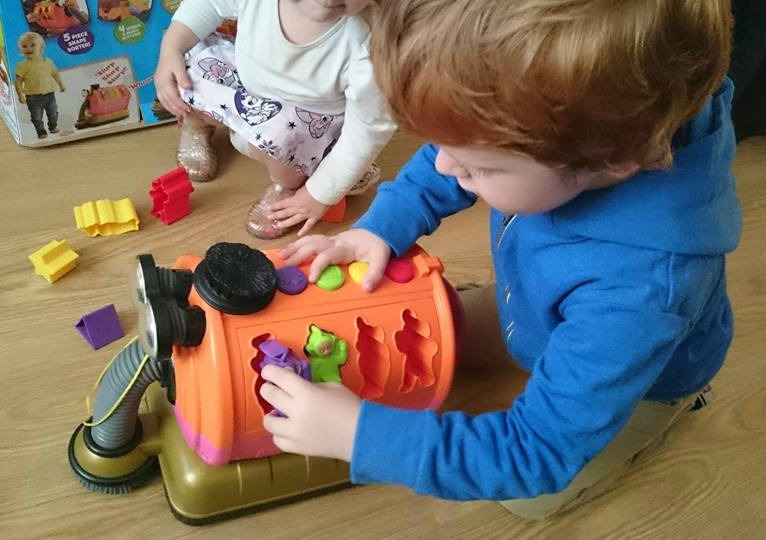 When we were offered the chance to review the Pull 'n Play Noo Noo I was sure it would be a massive hit with both of my children. Noo Noo is quite large and must feel like lifesize for my kids and he is just packed full of fun activities. On the top right you have a 3D puzzle type activity. The pieces are the four Teletubby characters and they each have a little handle so you can take them out and put them back again. E (2 years old) especially loved this and worked out quite quickly where each Teletubby went. On the opposite side there is a five piece shape sorter - 4 regular shapes and one is Po's face. C was able to do these right away but I almost saw the cogs whirring in E's head as she tried to work out which shape fitted in which hole. 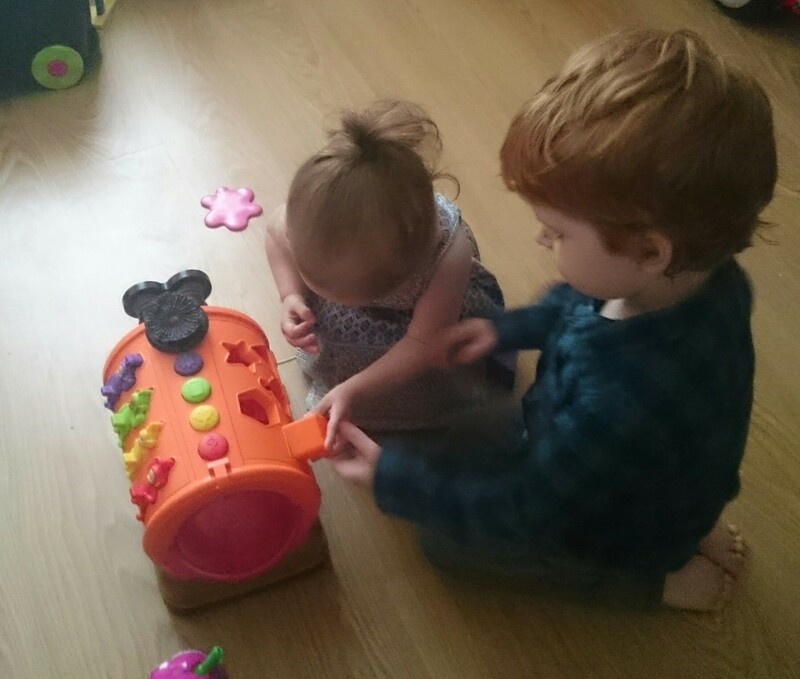 I love the educational aspect of the toy and it has definitely helped her hand-eye coordination. I think she was more inclined to really work hard because she was familiar with the characters. 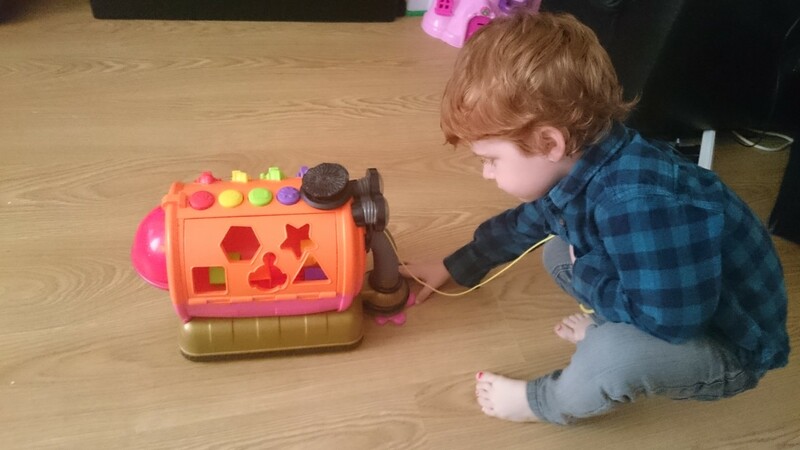 There are four buttons along the top which when pressed give out sounds of Teletubby speech, music and sound effects. C and E both love to have a little boogie when the music plays. The back of Noo Noo also lights up. As a parent, I love that you can mute Noo Noo without turning off the lights! On so many occasions I've had toys go off in the middle of the night which have frightened the life out of me. More toys should have this setting! Much like the real Noo Noo on the show, he has googly eyes (which 4 year old C finds hilarious) and a spinning brush. 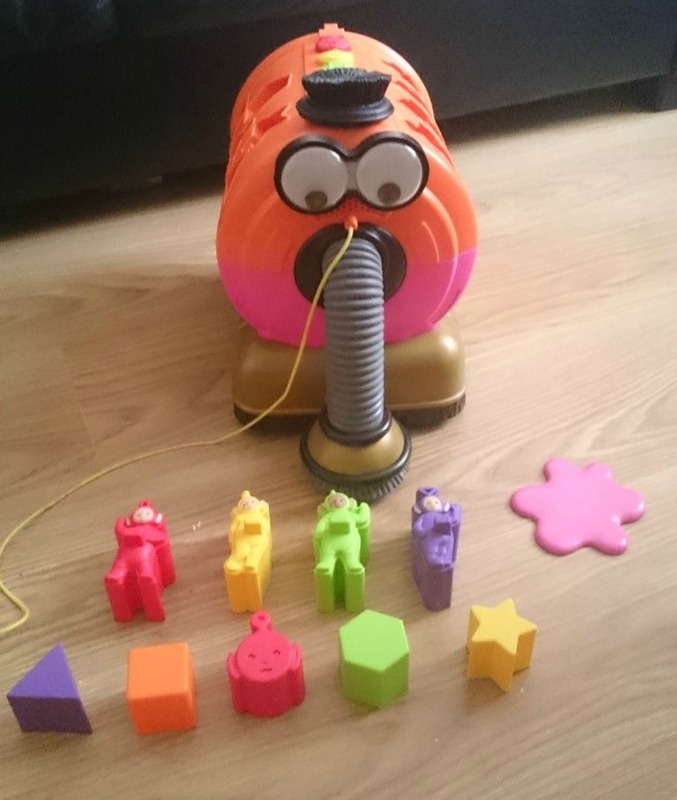 He also comes with a custard splat which is actually magnetic so when you pull Noo Noo around with the string attached to his front, he will pick up the splat with his nozzle when he comes into contact with it and even makes slurping sounds! All of the pieces can be stored inside Noo Noo too so I don't have to worry about any of them getting lost. This is probably one of the best toys that we have owned in recent times. It is suitable for children aged 18 months-4 years so both of my children have actually been fighting over it because they love it so much! As it has such a great age range, it would definitely make a great gift that would get played with lots over the years. My two play with it daily! 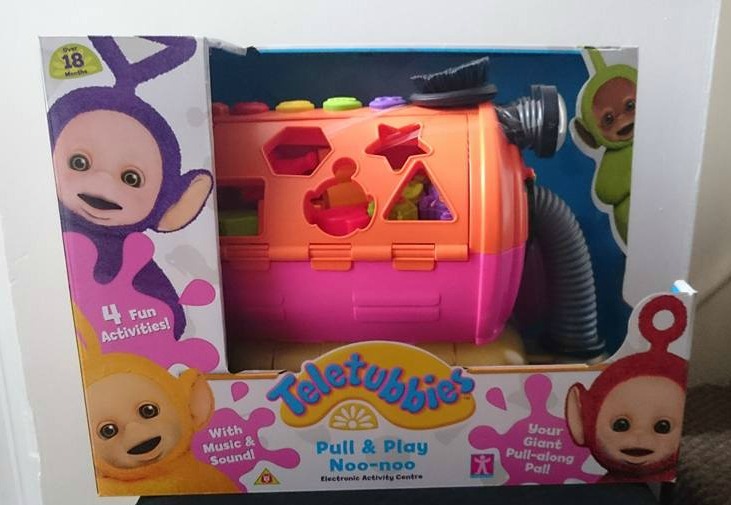 The Teletubbies Pull 'n Play Noo Noo retails at £49.99 and it is available from Character.